The City of Colorado Springs has begun preliminary design plans for roadway improvements along 30th Street between Fontanero Street and Garden of the Gods Road. This road has been identified as a corridor with needed safety, pavement and drainage improvements that will better facilitate emergency vehicles and provide for an emergency evacuation route. Design elements will include widened shoulders, drainage abatement, slope stability and traffic flow at intersections. $1.5 million in design work is funded through the Pike's Peak Rural Transportation Authority (PPRTA) and Public Works Capital Funding. The City has contracted with FHU Engineering, to design Phase 1 of the project, in the amount of $700,000. Funding for the Construction Phase for safety improvements along this vital corridor will be supplemented with a $7.1 million state grant. This project scope has changed over time, from its original inception 5 years ago. Previous designs were shorter in distance and in scope. 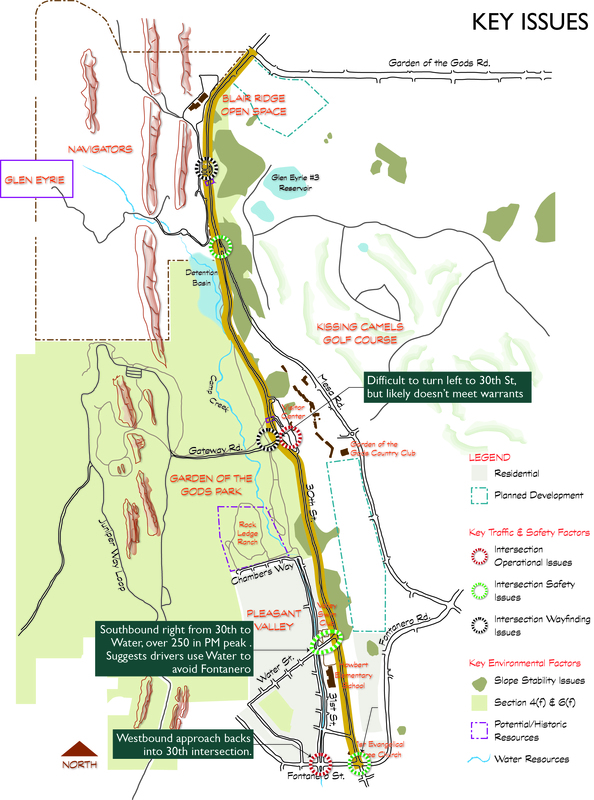 The current project improvements have been increased to two miles, and aims to accommodate additional necessary improvements along the corridor including drainage abatement and slope stability. To best serve the community and address the issues that exist along corridor, the new design will accommodate current and future needs in an overall corridor plan and environmental clearances. The City has contracted the local engineering firm of Felsburg, Holt & Ullevig (FHU) to provide the design services. A major aspect of the work includes development of a Preferred Alternative for the corridor including some of the following major elements: widened shoulders, storm sewer, water quality, pavement design, intersection design, landslide mitigation, structural design, environmental clearances and ultimately design plans. The Preferred Alternative analysis will consider the ultimate width of 30th Street to accommodate storm water design, water quality, intersection improvements and multi-use shoulders/bike lanes. The project will also collect data for historic and cultural resources, Tribal lands, wetlands, air quality, wildlife movements, and visual and noise impacts. The transportation design plan will include traffic/safety analysis, integrated multi-use shoulders, access considerations, and corridor-wide visual concepts for structural walls, gateway features to the Garden of the Gods Park, and other roadway appurtenances. The City will be working closely with stakeholders and the Community to collect input towards the overall design of these safety and roadway improvements. Public meetings will be scheduled during the preliminary design/Alternatives Analysis phase of the project. In addition, final designs will be presented during a public open house prior to the start of construction. Public Involvement and Alternative Analysis through Preliminary Design will occur from May 2017 to May 2018. Final Design and environmental clearances are anticipated by Fall 2019. Once design of the first segment from the preferred alternative and environmental clearances are complete, construction can begin. Federal funding will be used, so the recommended alternative will require clearance through the National Environmental Policy Act (NEPA) process. Independent projects will be identified in an implementation plan. The first of the independent projects to be constructed is anticipated to be 30th Street from Fontanero to Mesa Road to construct the recommended pavement width and drainage improvements with a construction start date goal of the summer of 2020. Public meeting #1-- input and approval on project issues, project process, and purpose and need for the project. Additional goals may include input and approval on the alternative screening process, range of alternatives and a draft set of screening criteria. Public meeting #2 -- present the full range of alternatives considered, final screening criteria, screening process, and the recommended alternative. Additional goals will be to receive input on visual design elements, materials, colors, view sheds, nodal improvements, and potential gateway elements. A full range of alternatives will be developed to support the NEPA process along 30th Street from Fontanero Street to the Garden of the Gods Road. Water Quality Best Management Practices (BMPs) will be developed for the project along with a storm sewer layout for the selected alternative will be developed. 1. What is the overall purpose for improving the 30th Street corridor? The 30th Street Corridor is in need of pavement resurfacing, new shoulders, slope stabilization and drainage improvements. Also, 30th Street has been identified as an Emergency Evacuation Corridor for Colorado Springs. The current roadway width is 24 feet wide, with no shoulders. Widening the road will allow drivers to pull over more easily in the event of a minor roadside emergency. Adding asphalt shoulders will also allow emergency vehicles like ambulances and fire trucks to pass other vehicles more safely on this two-lane road. 2. What will 30th Street look like after this project is complete? This project will increase the width of the road from 24 to 37 feet. The new design will allow for two 11 foot travel lanes, a 5 foot multi-use shoulder on each side, and a 2.5 foot curb and gutter on each side. The proposed cross section was developed due to existing topography on the east (steep slopes with slope instability) and to reduce impact to existing neighborhoods on the west side of the corridor. 3. Will extra lanes be added to 30th Street? No, the design of the road configuration with the multi-use shoulder is NOT intended to add lane capacity or new motorized lanes. New multi-use shoulders will provide additional width to facilitate pulling over during emergency response events. 4. Will the project add bike lanes? No, the multi-use shoulders may be used by bicyclists and for vehicular emergency pull off, but the added shoulder will NOT be striped as a designated bike lane. 5. Will sidewalks be constructed? No. Existing topography (steep slopes with slope instability) will increase the cost of a typical sidewalk installation. Our current budget will not allow for construction of sidewalks at this time. 6. How much will the project cost? The first segment of this project will total $9.8 million. This cost includes design and construction. The City has received federal grant money to construct roadway widening. A budget of $8.6 million aims to widen 30th Street from Fontanero Street to Mesa Road This construction will include asphalt pavement, concrete curb and gutter, storm drain facilities, and slope stabilization walls (east side). An additional $1.2 million in Statewide Transportation Improvement Program (STIP) funding was recently secured to construct a roundabout at the intersection of Gateway Road and 30th Street. The project cost for the remainder of the corridor will be defined in the future and could be included in the next Pikes Peak Rural Transportation Authority project list. 7. What is the recommendation for the Gateway Road intersection? Some of the issues associated with the Gateway Road intersection include operations, congestion and a sense of arrival. A roundabout intersection has been identified as the recommended alternative. A roundabout will most effectively meet the community values related to the park and for keeping a rural, unobstructed setting versus non-urban elements such as a traffic signal. A roundabout addresses all of the issues identified at this intersection – speeding traffic, congestion at Gateway Road, and the desire for a gateway feature. 8. What is the recommendation for the Fontanero Street intersection? 9. What is the recommendation for the intersection at Water Street? Some of the issues associated with the Water Street intersection include sight distance issues causing T-bone accidents, cut-through traffic, and neighborhood access. Neighborhood residents have indicated they want this access off 30th Street to remain and not have the access pushed down to 31st Street. The recommendation is to modify the angle of Water Street slightly, shifting it to the east as it connects to 30th Street, providing better visibility for drivers exiting Water Street, avoiding park and neighborhood impacts. 10. What is the recommendation for the intersection at Mesa Road? The intersection geometry at Mesa Road can be modified to improve safety. The recommendation is to reconfigure the entry angle to be more perpendicular for better driver navigation. This will involve retaining walls, and also consider existing trail access and connections on the west and east side of 30th Street. This recommendation removes the acceleration lane, improves geometry, provides trail connection across 30th Street, incurs minimal impacts to the park, and may include a pedestrian-activated signal for trails. 11. What are the issues at the intersection at the entrance to the Navigators/Glen Eyrie Castle? Some of the issues associated with the intersection at the entrance to the Navigators/Glen Eyrie Castle include lack of left turn lanes and traffic friction with the Blair Bridge Open Space parking area. Analysis shows that this intersection would perform better with left turn lanes to access the site, and with a more defined access to the Blair Bridge Open Space parking area. This intersection improvement has been identified as a potential future project but is not funded at this time. 12. Did you look at the development and growth predicted for the US 24/Ute Pass area? Yes, we looked at the 2040 traffic projections from the Pikes Peak Area Council of Governments Travel Demand Model. This study indicates a small amount of traffic growth in the future; thus a two-lane configuration for 30th Street will continue to adequately service the area in 2040. 13. How will wildlife crossing and wildlife accidents be mitigated? The project team has collected data involving vehicle-animal accidents and found that there are no evident crossing patterns associated with the accidents. The project team is looking into options to improve safety in the corridor and potentially reduce animal-vehicular accidents. 14. Was a traffic study conducted? Yes, a traffic study was conducted in June 2017 to capture peak traffic data at four intersections between Fontanero Street and Mesa Road Crash data was compiled for total crashes, type of crash, locations, and cause of accident. Each of the intersections were analyzed as to how they impact the corridor. 15. What are the issues associated with landslides along the corridor? Preliminary studies have confirmed active sliding just north of the Garden of the Gods Visitor Center. Inactive landslide areas and slumps also exist along the corridor. Geotechnical engineers are developing cost-effective solutions to mitigate slope instabilities and slope instability. The current recommendation from the geotechnical group is to install “Soldier Pile Walls” to inhibit soil movement in areas with active sliding. 16. Will there be a public process for this corridor study? Yes, the project team has already conducted ongoing meetings with residents, property owners, and stakeholders along the corridor and also with neighborhood association boards. An open public meeting will be scheduled in Spring/Summer 2018. Sign up for public meeting notices by sending an email to Gigi@Bachmanpr.com requesting to be added to the project database. 17. Will the public have the opportunity to provide input on each of the alternatives being considered? 18. What is the project schedule? Construction is scheduled to start in 2020, contingent upon environmental clearances. Construction is expected to last approximately 12 to 18 months. 19. What relationship and overlaps does the 30th Street Project have to the Camp Creek Project? An additional overlap is the Foothills Trail extension (Parks) from 31st Street to Gateway Road. The trail extension will be adjacent to 30th Street. 5:30 to 7:30 p.m. with a presentation at 6 p.m.
Holmes Middle School, 2455 Mesa Rd. For special ADA accommodations, please call 719/488-5908 at least 48 hours in advance of the meeting. Over the past several months, the City and project team have been gathering input from stakeholders, property owners and organizations with interests along the corridor. Their input has helped guide recommendations to address issues and for improvements along the 30th Street Corridor being presented for public feedback during the June 14 public meeting.